This has been a huge week for our prestigious Supreme Court. They delivered monumental rulings that will dramatically change this great country. The rulings that garnered the most attention were the Voting Rights Act ruling, the Defense of Marriage Act ruling, and California’s Prop 8 ruling. Preceding all three of those by a few days there was another Supreme Court ruling that didn’t get much attention at all. I believe it’s just as significant and monumental as the three I named, but I’ll put that one aside for the moment and comment on the three attention grabbers first. Afterward I’ll explain what the lesser known ruling is and how it will impact the direction of our country. I’ll start with the good news first. At approximately 9am the United States Supreme Court handed down a decision that struck down DOMA (the defense of marriage act) which lifted the federal ban on gay marriage. With a 5-4 vote Justice’s Ginsburg, Breyer, Sotomayor, Kagan and Kennedy all voted in favor of lifting the ban and Justice Anthony Kennedy wrote the majority opinion which states “The federal statute is invalid, for no legitimate purpose overcomes the purpose and effect to disparage and to injure those whom the State, by its marriage laws, sought to protect in personhood and dignity. By seeking to displace this protection and treating those persons as living in marriages less respected than others, the federal statute is in violation of the Fifth Amendment.” Of course the dissenting Justice’s were Roberts, Scalia, Alito, and Thomas. All four are ultra conservatives so their opposition to gay marriage is no secret. Now that DOMA was ruled unconstitutional by the highest court in the land, legal gay marriage in all 50 states is all but certain. Immediately following the DOMA decision the court ruled on California’s Prop 8. Prop 8 was a ballot measure in California that wanted to define marriage as 1 man and 1 woman. Before this ballot measure gay marriage was legal in California. After Prop 8 reversed legal gay marriage in California, a federal court in San Francisco struck it down on the grounds that it unfairly discriminated against gays and lesbians who wished to marry. California’s governor and state attorney refused to take the case to the Supreme Court because they were supporters of gay marriage, so an outside anti-gay organization decided to argue the validity of Prop 8 in the place of the state attorney to the Supreme Court (which has never been done before). In another 5 to 4 vote the Supreme Court decided that a private organization did not have legal standing to appeal after the ballot measure was struck down by a federal judge… thus killing Prop 8 and legalizing gay marriage in the state of California once again. Both of these historic rulings fills me with optimism and reaffirms my belief that this country really is the land of the free. This week the Supreme Court also ruled on the constitutionality of the Voting Rights Act. In a 5 to 4 decision their ruling on this matter shakes the very foundation of my aforementioned reaffirmed optimism. This decision guts the very heart of the Voting Rights Act freeing nine mostly southern states to change their election laws without advance federal approval. Republican governors wasted no time rushing to file numerous new voting restrictions in every state where they have legislative control. Most of these new voter laws were blocked due to federal law during the last election. Congress has the power to redraw the map of states where voting laws need more scrutiny, but any action is unlikely as long as republicans hold a majority in the house. The GOP’s reaction to this new ruling is further evidence that they are aware that a large majority of American’s do not agree with their ideology and they know keeping minorities away from the polls is the only way they can win any future election. I believe their constant overreaching will hurt them in the midterm elections next year. The more they fight minorities and gays, the more determined and involved we become. Now here’s the ruling you probably haven’t heard about. 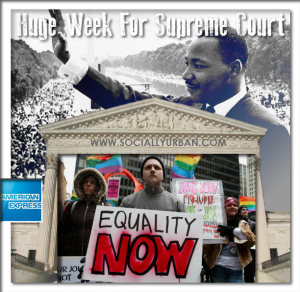 The gay marriage and the voting rights rulings made headlines all across the country and lead every newscast for days. They were huge stories so of course they deserved huge attention. But there was another Supreme Court ruling this past week that should have gotten just as much attention as the other three rulings did. Unfortunately the “powers that be” minimize the news coverage when it involves corporations flexing their power to stay above the law. American Express (huge credit card conglomerate) appeared before the Supreme Court to bar a class-action claim against them. A group of small restaurant owners joined together to sue American Express claiming that the company engaged in monopolistic business practices to force the merchants to accept their new credit card (with higher merchant fees) after they signed an agreement to accept their debit cards. This put the merchants in difficult position because they could not afford the higher fees, but losing the ability to accept AmEx debit cards would hurt their business as well. So the small group of restaurant owners banded together to sue American Express. American Express did not want a court jury trial and they challenged the merchants right to join together for a class-action suit. Instead they wanted arbitration (controlled by an arbiter of American Express’s choice) with each merchant independently. That’s how this legal issue ended up in front of the Supreme Court. To me, this seems like such an easy ruling. No corporation should be able to dictate the terms of which they are being sued for. But 5 out of 8 Justices did not share this opinion. They decided that the merchants could not band together, but not only that the Justices also ruled that American Express can force a merchant into an arbitration controlled by them. WTF? When did corporations get more rights than an American citizen? This ruling says corporations can deflect any lawsuit brought against them from this point on. Where’s the accountability? In a strongly worded dissent, Justice Elena Kagan said the decision means “the monopolist gets to use its monopoly power to insist on a contract effectively depriving its victims of all legal recourse.” The ruling was the third in three years to shut down class-action efforts brought on behalf of employees, consumers and now small-business owners. Lawyers on both sides of the issue said the court’s conservative wing was determined to shield companies from these broad lawsuits. The court has taken another big step down the road of permitting companies to use arbitration agreements to entirely insulate themselves from class-action liability. Even more proof that right wing conservatives do not give a damn about the people they are supposed to represent, and despite their rhetoric claiming to champion small businesses, their actions paint an entirely different picture.